Stainless steel case with a stainless steel bracelet. Fixed stainless steel bezel. Black dial with silver-tone hands and index hour markers. Minute markers. Tachymeter around the outer rim. Dial Type: Analog. Luminescent hands and markers. Chronograph / Multi-Function – three dual sub-dials displaying: 60 seconds and date, 30 minutes and month, 12 hours and day of the week. Moon phase display at the 3 o’clock position. Automatic movement. Scratch resistant sapphire crystal. Non screw locked crown – two gaskets. Solid case back. Case diameter: 43 mm. Case thickness: 15.25 mm. Round case shape. Deployment clasp. Water resistant at 50 meters / 165 feet. Functions: chronograph, date, day, 24 hour, hour, minute, second. Luxury watch style. 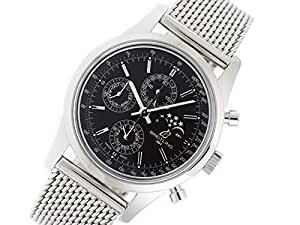 Breitling Transocean Chrono 1461 Mens Watch A1931012/BB68. Comes with Gift Box and 2 Year PWJ Store Warranty. *Please note that the production year of the listed watch is an estimation only*. Buy with confidence knowing each timepiece goes through the same rigorous 31-point inspection. Rest assured only authentic parts straight from the manufacturer are used. The Certified Pre-Owned Program on Amazon ensures peace of mind and transparency via standardized reports and a 1 Year Warranty Provided by WatchFacts.